Several of my photographer buddies from work decided to do an early morning photowalk in Tempe, Arizona this past Saturday morning. The plan was to meet at the Starbucks on Mill Avenue between 6:00 and 6:15 AM. Since it’s a 35 minute drive for me to get there, I had to get up at an ungodly hour (for a Saturday). It was so tempting to just bail on the guys, but I thought it would be a great chance to compare notes with other non-professionals, plus get some good sunrise shots on Tempe Town Lake. To the right is the Mill Avenue bridge which carries vehicle traffic. To the left you can see the light trails created from the passing of the light rail train as it traveled over the Lake. The boats are just waiting for the sun to come up to start taking passengers. You can see more shots from our photowalk in the set that I’ve posted on Flickr, called Tempe Photowalk 2011.01.15. I’ve just started processing, so more images will be added to the set soon. I’ll be posting a few more on this blog as well. This was my first photowalk, and I’d like to thank Ed Brice for organizing things for us, and Adam Schmid and Kurt Neurauter for lots of great tips and good humor. I had a blast and look forward to more of these excursions! 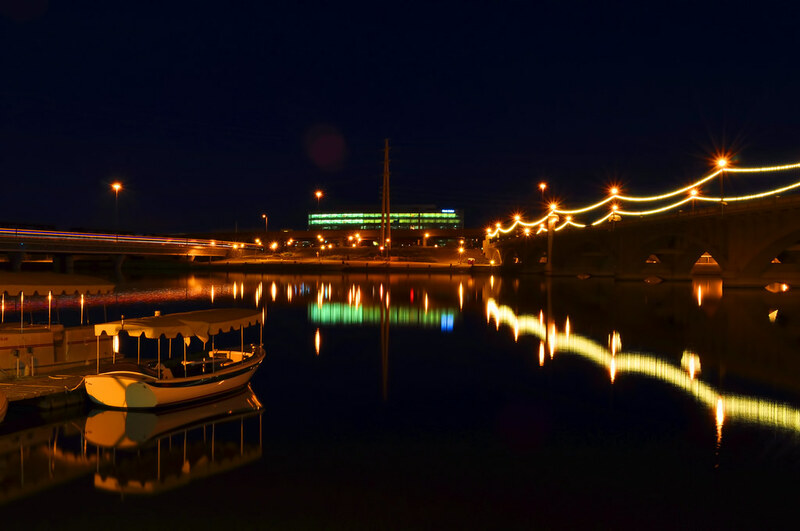 This entry was posted in Commentary, Information, Shooting and tagged Arizona, AZ, blue hour, boat, bridge, camera, D5000, dawn, lake, light trail, night, Nikon, Paint Shop Pro, reflection, Tempe, Topaz, Town Lake, water. Bookmark the permalink.